Under the watchful eye of instructors who give immediate feedback, students learn to shoot safely from unconventional positions. What these students are telling me is that the training industry has generally done a poor job in educating shooters about why they might need professional training. The problem is compounded greatly by state-required classes for concealed carry permits, which a great many people still think of as “real training.” These classes can provide good information, and in most cases they’re probably better than nothing, but their primary purpose is really NOT to train the students how to defend themselves. On the contrary, the primary purpose for these state-required classes is to assure political leaders that people who acquire a CCW permit in their states will not endanger the public. This is a far cry from being sure that the permit holders are themselves safer and better able to defend themselves from criminal attacks. As a lifelong autodidact, I was a bit taken aback the first time a friend suggested to me that I might benefit from professional firearms training. “Good grief!” I thought. “This stuff is not rocket science. Why can’t I just teach myself, or learn from books and videos?” Fortunately, I took my friend’s advice anyway. Why not learn from a book? There are a lot of really wonderful things you can learn about self-defense from books. Chief among these is mindset. Books can be a wonderful way to impart philosophical points (see The Art of War by Sun Tzu; Principles of Personal Defense by Jeff Cooper). A short section of the author’s personal bookcase. They can give the reader practical and tactical concepts (see Guns, Bullets, and Gunfights by Jim Cirillo; Train to Win by Wes Doss; Teaching Women to Shoot by Diane Nicholl and Vicki Farnam). They can address specific social considerations and give a good overview of the process of becoming a responsibly armed citizen (see Self Defense for Women by Gila Hayes). They can address legal issues (see In The Gravest Extreme by Massad Ayoob) and ethical questions, too (see Shooting Back by Charl Van Wyk; Into the Kill Zone by David Klinger). They can help prepare you to deal with the aftermath of using deadly force in self defense (see Deadly Force by Massad Ayoob) or teach you how to effectively defuse or avoid trouble before it starts (see Conflict Communication by Rory Miller). There’s absolutely nothing wrong with the above description. It’s pretty clear to anyone who has ever seen a back fall done. But to someone who has never seen a martial artist perform a basic back fall, there are a lot of unanswered questions. With dummy gun in hand, a student learns how to safely subdue a surrendered attacker. The opportunity to work with willing partners in directed and supervised role play is one significant benefit of professional training. Without actually seeing the task performed, the inexperienced reader will have a difficult time properly doing it. What’s more important is there isn’t any feedback to tell you whether you did it right when you try it for the very first time. Ah ha!, some of our more astute readers are thinking, then what about seeing it on video? There’s really no denying that it is significantly easier to learn a physical task from watching a video than it is to learn the same task from the written word. For one thing, the viewer can actually see the action. You can watch the timing of the events, see how one motion flows into the next and then into a third. And, as with a book, there’s the wonderful, wonderful advantage of being able to stop the action and think about what you’ve just seen. You can rewind it to the spot where you got confused, or slow it down enough that you can clearly see what is going on and have time to assimilate each step before moving on to the next. In some ways, videos are better than real life. Videos are not terrifically portable. Typically, you watch videos in the comfort of your own home, absorb as much information as you can, and then take that information (however much of it you’ve absorbed) out to the range with you. If you’re missing a piece that you need to know, you have to go home and watch the video again in order to get it. More likely, you’ll just guess and fill in the gap, thinking that you are doing what the video suggested. 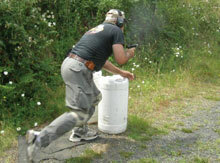 Professional firearms classes allow shooters to learn and practice skills which may not be allowed on their home ranges. Experienced shooters and intelligent people often have a hard time believing how much they need this honest and direct feedback from a skilled observer. But everybody does need it—and the longer the shooter has practiced without formal training, the more desperately they are likely to need this feedback as it relates to both safety issues and shooting techniques. When I first began working out of a holster, I thought I was doing pretty well with it. Maybe I wasn’t as fast as others, I reasoned, but at least I was doing everything safely. Or so I thought. Right up until a professional firearms instructor stood next to me and said, “Hey. You just pointed the muzzle at your own hand.” I did? I hadn’t even been aware of it! And that’s just for gross and obvious safety issues. 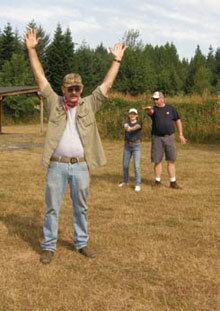 Shooting skills are even more prone to this type of personal blindness. One of the most powerful tools a good instructor has in the toolbox is a little trick called the “exemplar drill.” Most instructors are vividly (and sometimes bitterly) aware that no matter how carefully they describe a good, smooth, steady trigger press, a certain number of their students simply cannot wrap their minds around the concept. You can describe it, write about it, show video of it, demonstrate it, talk them through it—and too many folks will still not get it. So with the exemplar drill, we stand next to the student, have them place their sights on target and their fingers on the trigger without pulling it. Then the instructor comes alongside and carefully puts a trained trigger finger over the student’s trigger finger, tactilely demonstrating what a good and correct trigger press actually feels like, the steadily increasing pressure until the shot finally breaks and a good solid follow through after the shot fires. It’s a great tool. And it’s a necessary tool, because sometimes words and even example just aren’t enough. I’ll never forget the first time I stood next to a student and did an exemplar drill with him. It was like watching a light bulb go on over the student’s head. He turned to me in amazement. “But that’s what I thought I was doing before!” he exclaimed. Nor is this dynamic unique to trigger press alone. Whether it’s a sloppy and fumble-prone drawstroke, a pattern of movement which guarantees a stumble with gun in hand, or an awkwardly slow method for clearing a malfunction or reloading, every single shooter on the planet has blind spots. These problems can be corrected easily when spotted by an experienced observer, but are very unlikely to be corrected by the shooter who is not aware of them in the first place. Besides this necessary feedback, there are other benefits to being directly trained by a professional rather than teaching yourself. Using the exemplar drill, an instructor’s trained trigger finger can give the student the direct tactile sensation of performing a smooth and controlled trigger press. It is surprising how many experienced shooters misunderstand the basics of trigger control. Good instructors incrementally build skill upon skill, technique upon technique, until the students are blowing the centers out of the targets much faster and more accurately than they ever believed was possible. Attaining this increased skill level is accomplished not by simply shooting a lot of ammunition, but by building a solid foundation first, and then shooting that ammunition with a purpose and a plan. Good instructors force their students to learn and then to practice skills the students aren’t already good at when they come into the class. This counters the natural human tendency to over-learn the stuff we already know, while neglecting the stuff we need to learn. There is not enough time in one lifetime to make all the mistakes yourself. While any given instructor might directly discover or invent a solid technique to solve a specific shooting problem, all the best instructors have learned from many other good people who have done the same thing and then compared notes. This means that the solutions Jeff Cooper found in his heyday are still being passed along; that the lessons Jim Cirillo taught the world did not perish with him. It means that the way Jack Weaver stood to shoot, and the tweaks that Ray Chapman gave to Weaver’s stance are still being taught and refined by others. The Hackathorn Rip, the Bill Drill, the Ayoob Wedge, and the El Presidente are all easily available to the serious student, even in classes where these techniques or practice routines have been discarded in favor of newer ones. Dennis Tueller’s famous drill is run in dozens of schools. But you needn’t attend a dozen different schools to be exposed to this body of knowledge, because professional instructors talk to each other and learn from each other. They filter through a tremendous sea of distilled experience so they can pass the best ideas straight down to their students. Learning directly from a professional trainer provides another little-advertised advantage. Students who have attended a professional school often have access to resources available only through that school: secure email lists, private forums, assurances of personal help if legal problems arise, referrals to trusted lawyers and expert witnesses and trauma counselors after a deadly force event. These valuable resources are usually available only to people personally known to (and trained by) the professional who offers them.